Overlooking your garden or placed on your porch or patio, the versatility of our Poly English Garden Bench shines in any outdoor decor! Crafted with a classic garden design, a gently curved seat and angled slat back, you and your guests can enjoy this comfortable bench for hours on end. Choose the perfect color, or combine two and get a bench that will compliment any outdoor space! Add the matching cupholder and your new bench will also have a convenient place to rest your drink as you relax and enjoy the outdoors. 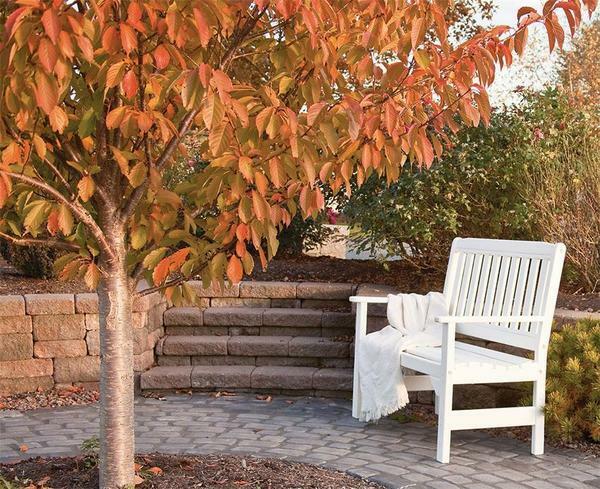 Each 4' Poly English Garden Bench is handmade by the Amish in Lancaster, PA. These American Made Poly Benches are crafted from an eco-friendly material called poly lumber, derived from post consumer recycled milk jugs and detergent containers. This not only keeps them out of landfills, but also goes into producing a piece of outdoor furniture that is resistant to fading from sun exposure, splintering and cracking from rain or snow and requiring sanding and resealing like wooden pieces. Your investment in outdoor furniture will last decades with our Leisure Lawns Poly Furniture. And, to prove it, each piece comes with a 20 year residential warranty for peace of mind. Create the perfect patio set when you add the matching Poly English Garden Coffee Table and Arm Chair.